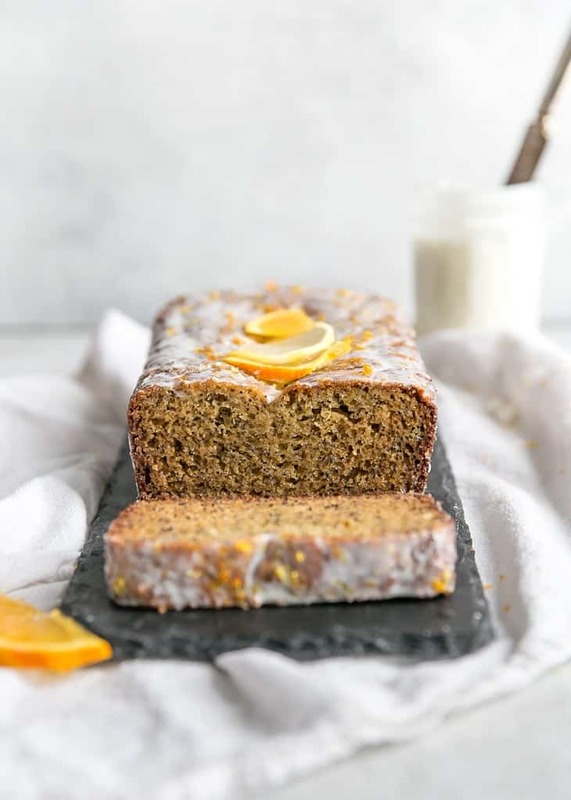 Orange Lemon Poppy Seed Loaf / Bread – whatever you want to call it AKA DELICIOUS. 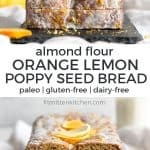 Made with almond flour and paleo-friendly, you will love this. I can never get enough citrus flavored baked goods and desserts. Hopefully we’re on the same page because I think you guys are really going to enjoy this one. One of my most loved recipes is this Almond Flour Lemon Blueberry Bread and I just *had* to make another version for you. I thought it was too basic to do a regular ole lemon poppy seed. Re: not different enough from my original paleo bread recipe. It’s funny how the mind works, eh? I don’t think you would have cared much… Especially if you are here for the first time and didn’t even know about my Lemon Blueberry Bread. This is my over-analytical food blogger brain talking. I digress. I first tested this recipe with just orange and I didn’t feel like the flavor was quite there. So I combined orange WITH lemon and voilà! 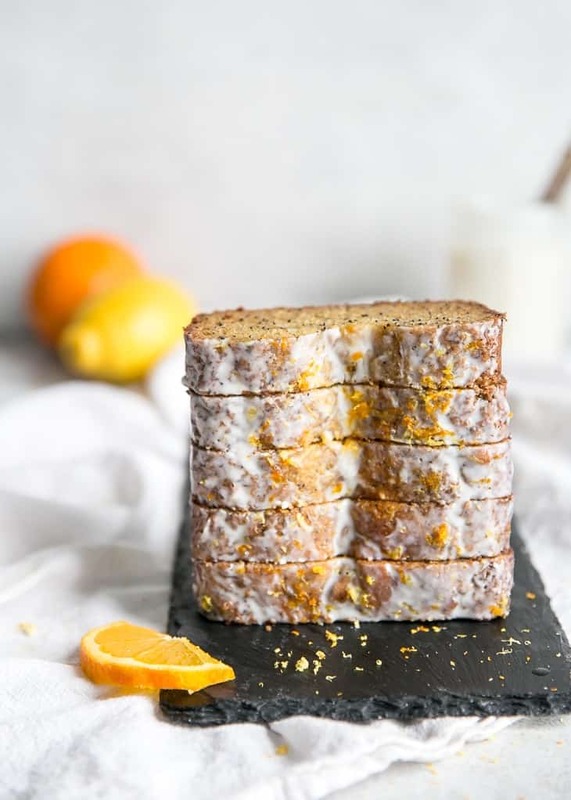 This citrus, tangy, lightly sweet paleo bread was born. We’re using almond flour as the main ingredient here, with no coconut flour needed. 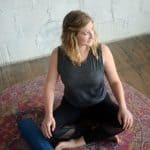 You will need some kind of binder though – I used tapioca but I’ve had others say they use arrowroot starch in place of tapioca flour and it works the same. You probably won’t believe how simple this bread is. I mean, sure there is a little bit of work in the zest and juicing the citrus. But other than that? Super simple. You’ll mix together the wet and dry ingredients separately – this will make sure everything is evenly combined. When whisking together the eggs with the honey, maple syrup and oil you may notice the honey wants to stick to the bottom of the bowl. Just make sure you use a deep and large enough bowl so you can whisk quickly without it splashing outside of the bowl. Or use a hand mixer to help speed things up. Then the bowl of dry ingredients get added to the wet mixture and transferred to a medium loaf pan. When baking this bread, you’ll want to cover the pan with foil after about 12-15 minutes. This will prevent the top from darkening too much. Bake for another 15-25 minutes, or until inserted toothpick in center comes out with no wet batter. I kept checking mine every 10 minutes just to be sure. The bread may fall a touch, but it will still taste delicious and be moist. Almond flour: Be sure to use a super fine, blanched almond flour here. The super fine texture will keep the texture lighter. Whereas almond meal won’t hold together as well. Tapioca flour: I used tapioca flour here to avoid having to use coconut flour. 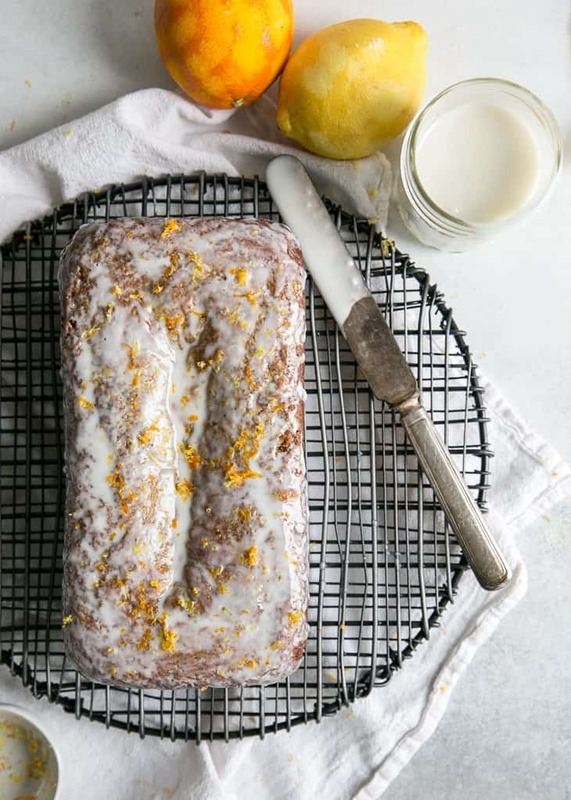 Other readers have used arrowroot starch in place of tapioca flour in the Lemon Blueberry Bread with success, so you should be fine to sub here too. Sweeteners: It’s best to stick with a liquid sweetener here, as it affects the ratio of the wet-to-dry ingredients. You can *probably* use all maple syrup here but I did not test it that way. The bread also bakes slightly brown on top because honey “burns” quicker. I did about half honey and half maple syrup. You can also use all honey but the bread won’t be as sweet. 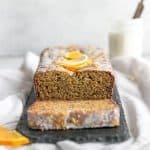 Citrus: If you’d like you can also just make this into a regular lemon poppy seed bread and use all lemons instead of adding orange in there. Grapefruit could also be a nice add-in! Glaze: I used coconut butter for a paleo-friendly glaze but if you can’t do coconut, you can just omit. I don’t think the bread truly needs a glaze, but the tangy and sweet topping does add a little extra goodness to each bite. If you make this recipe leave a comment and review below! 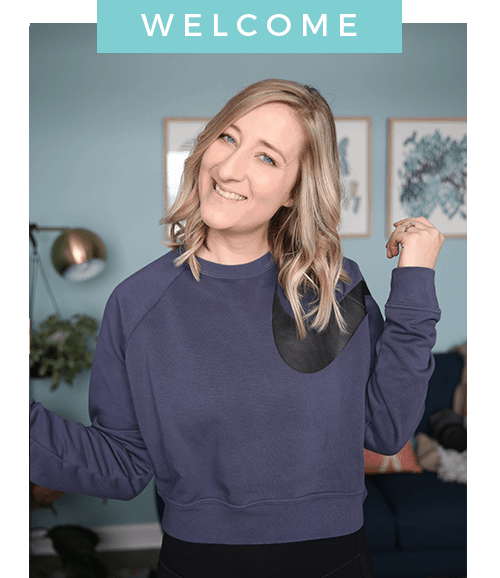 I love hearing from you and it helps others find the recipe too! Preheat oven to 350ºF and line a 8×4 medium loaf pan with parchment paper; set aside. 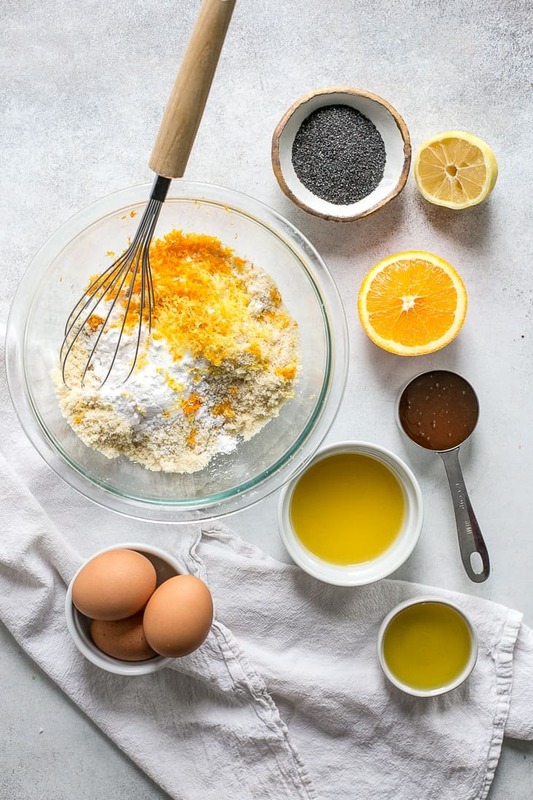 In medium bowl add almond flour, tapioca flour, baking soda, salt, poppy seeds, zest from lemon and orange; set aside. In large bowl whisk together eggs, oil, honey, maple syrup, lemon juice, orange juice and extracts. Pour dry ingredients into large bowl of wet ingredients, using spatula to stir. Pour batter into prepared loaf pan. 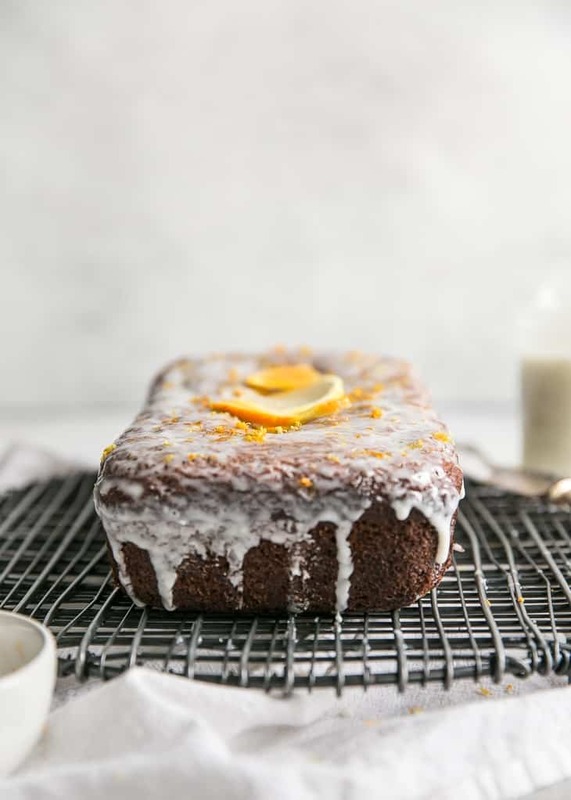 Bake orange lemon poppy seed bread for 15 minutes uncovered, then add foil and continue baking for another 20-25 minutes. Be sure to check the bread after baking for 35 minutes total – the edges will get brown but the bread will be ready when inserted toothpick comes out with no wet batter. The middle may fall slightly, this is okay! The bread still tastes delicious. Allow bread to cool in pan for 15 minutes before lifting from the parchment paper to remove bread. Slice into 10 good-sized slices and ENJOY! You could totally get 12 pieces but they’ll be skinny and you’ll for sure want more than one. *I used a mix of honey and maple syrup to add the right amount of sweetness and to prevent the loaf from browning too much. You can use all honey with similar results. I did not test using all maple syrup but I assume it would work. **You can omit the glaze or also use a regular powdered sugar glaze. Simply mix 1/4 cup powdered sugar with 1-2 tsp lemon juice for a light coconut-free glaze. Nutrition info approximate based on ingredients listed.